I am happy to join the forum. 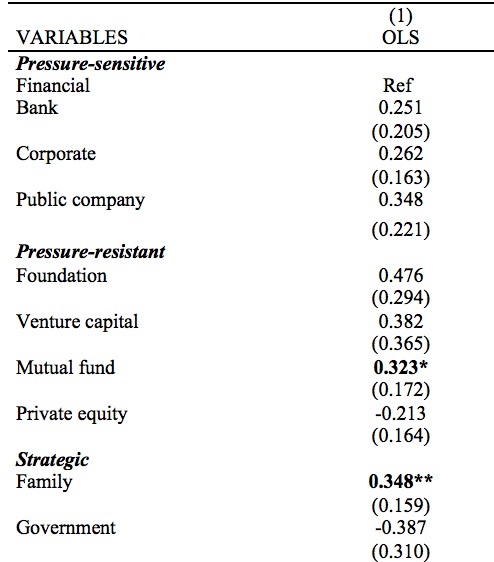 Compared to pressure-sensitive institutions, pressure-resistant institutions are on average more positively associated with R&D intensity. First, since I had to use a reference category due to dummy trap, I chose the most frequent, financial, a "sensitive" type. Now what concerned me is that the other sensitives are compared to this one as well. In the light of the results, is my hypothesis logical? I am not sure how else to formulate it. Looking at my hypothesis, is it true that I am reasoning; the pressure resistant types will be either more positive i.e. larger coefficients and statistically significant while the opposite is true for the sensitive types, compared the reference category. Sorry if this was badly formulated, I really hope someone understands my questions and can give some advice ! I am not sure what RE is. Or what sensitives are, or what a dummy trap is. You need to provide more details on your project and wording to have anyone help you here. You are dealing with a theory few, if any, are familiar with (I don't mean the methods). Are you using linear, logistic, or some other form of regression. How is your dependent variable measured? is it interval, ordinal, or nominal data. If you are using linear regression then the reference group will either have a larger or a smaller slope. When you have a dummy variable its most common to talk about the mean difference between the two levels and direction. So level one will be five units higher (or lower) than the zero level.